How the Washington Animal Disease Diagnostic Laboratory has been protecting our region and the nation for 40 years. by Marcia Hill Gossard ’99, ’04 Ph.D.| Photos by Henry Moore, Jr. Although this example is fictitious, it is the type of disease surveillance that has been done by the lab since 1974. 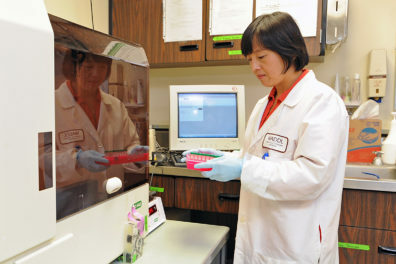 As one of the 12 core member laboratories in the National Animal Health Laboratory Network, WADDL (pronounced waddle), as it is commonly known, is on the frontline of disease detection, food safety, and testing for bioterrorist agents in the Pacific Northwest. 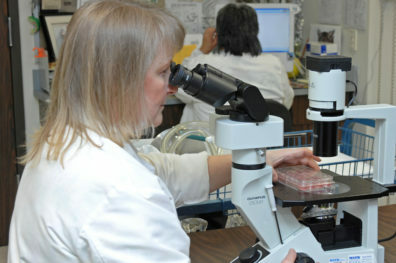 WADDL and other laboratories in the network provide national and regional surveillance, including an emergency response system in the event of an outbreak. “When we do disease surveillance for animals, we are also doing it for public health,” said Dr. Tim Baszler, who has been the director of the Washington Animal Disease Diagnostic Laboratory for six years. As the only animal disease laboratory in Washington State, WADDL is at the forefront of detecting and diagnosing diseases in animals— diseases that could also spread to humans. Mad cow and avian flu are just two examples of zoonotic diseases WADDL can test for, said Baszler. WADDL is just one of six labs in the country that tests for mad cow disease. Zoonotic diseases can spread quickly because of travel and global commerce, including the transport of animals. And improved surveillance can also provide information about how disease is transmitted from animals to animals or animals to humans. Besides testing for known zoonotic diseases, scientists at WADDL also use surveillance to identify newly emerging diseases. For example, if a veterinarian tests for a disease that they don’t recognize immediately, they will send it to WADDL for further testing. Each year surveillance detects emerging diseases and WADDL is part of that effort. We help our region, our nation, and the world. Foreign animal diseases such as mad cow and foot-and-mouth disease can devastate a cattle herd. For any highly infectious disease, surveillance and rapid testing is vital for preventing the spread of disease and keeping our food supply safe. Such fast response helps get sick animals quarantined sooner, which is critical for fast spreading diseases. But knowing quickly, can also help prevent serious economic consequences. The aquaculture industry in Washington State, for instance, relies on testing to export their products such as salmon eggs or fish. Together with state, tribal, federal and aquaculture industry partners, WADDL works to prevent the introduction of catastrophic diseases that could devastate farmed and wild salmonid fish stocks. And that is vital to economic stability and growth in the Pacific Northwest. WADDL scientists also test for common bacteria that cause food poisoning such as E. coli, salmonella, and listeria. According to the Centers for Disease Control and Prevention, these food-related illnesses affect millions each year and can result in hospitalization or death. WADDL, a state animal health laboratory, is uniquely sited at Washington State University. “We are a laboratory serving the state and public good in a university setting,” said McElwain. And that has its advantages. The lab provides education and training to students so they are ready to handle new and existing emerging diseases. They also learn about disease surveillance and its importance. And this, says McElwain, makes it a living laboratory for training. “We have a training program that includes veterinary students, undergraduate students and veterinary residents in pathology and microbiology,” said McElwain. Researchers at WADDL and the WSU College of Veterinary Medicine work to develop diagnostic tests and vaccines, and that leads to technology transfer to the field. Resources and collaboration with faculty at WSU has helped develop new types of tests for diseases such as sheep scrapie, a fatal disease affecting the nervous system of sheep and goats. If there is a disease outbreak, scientists at WADDL and in the college can collaborate to find the best solutions. Because of its unique role within the University, the state, and the region, there are plans to build enhanced facilities for its 70 employees by 2017. The new building will improve regional and national animal health surveillance capabilities and expand the global disease surveillance program in partnership with the Paul G. Allen School for Global Animal Health. The new facilities will also create new educational opportunities for WSU undergraduate, graduate and veterinary students. “We help our region, our nation, and the world,” said Baszler. As a full-service laboratory for all species of animals, the Washington Animal Disease Diagnostic Laboratory can help veterinarians in our region better serve their patients. The lab provides diagnostic testing for serious infectious diseases that affect dogs and cats such as canine distemper and feline coronavirus, or they can test tumors to help rule out cancer. They also offer testing for horse diseases including West Nile fever, equine infectious anemia virus, as well as nutritional deficiencies. WADDL is only one of six labs in the nation that tests for bovine spongiform encephalopathy, commonly known as mad cow disease. Without early disease detection, it could have devastating consequences to animal health, trade, and the economy.